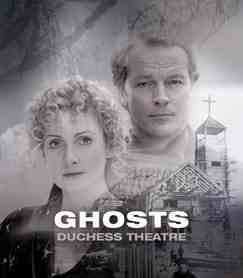 It is inevitable that any production of Ibsen’s Ghosts will not produce the shock of its first staging in 1882. The adultery, sexual disease, and spiritual rejection had more sordid punch than could be affected today. But the themes of hidden truths, haunting memory, broken dreams and assisted suicide remain poignant and relevant. With the ten-year memorial of the late Captain Alving and the return from Paris of prodigal son Oswald, dark concealed secrets are soon revealed. The truth of the Alving marriage; why Mrs Alving had scandalised the town by once deserting the family home and why she sent her only son away to school are painfully revealed in tangibly tense scenes between Lesley Sharp and Iain Glen as Pastor Mandors. And the horrid dilemma Oswald forces upon his mother reminds us of the recent euthanasia cases and the pained decisions faced by family members of their dying loved ones. Cries of “I gave life to you” from the mother and “Can you watch me suffer?” from the son are painfully pertinent today. 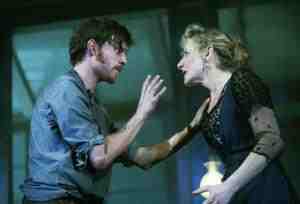 Lesley Sharp is sublime as the haunted widow. She enters loaded down with emotional turmoil hidden beneath a composed but taut physicality. Mrs Alving’s tortured struggle with her past, with the ghosts “not just of our fathers and mothers but the ghosts within us all”, and her tragic choice of helping her son to end his misery are tightly evoked by Sharp. As each veil of history is torn asunder, Sharp remains on the edge until the shattering, revealing finale. Harry Treadway as the syphilis-stricken Oswald seemed somewhat dazed in the early stages, staring like a bewildered Meerkat. But his conflict with ‘the sins of the father’ and the final scene with Sharp and the revelation of his condition are tenderly played. Jessica Raine is suitably innocent as Regina, whose own vanquished dreams of love and marriage are heartbreaking. Iain Glen’s Pastor is a powerful presence of judgemental piety. He cries disdain at any hint of immorality; from Mrs Alving’s reading matter to her once desperate attempt to flee her adulterous husband. One problem is that, whilst Ibsen’s religious cynicism would have caused a furore upon its inception, there is a sense that the Pastor’s actions have become comical. That’s more to do perhaps with the anachronistic sentiments – late nineteenth-century doctrine often sits awkwardly in the early twenty-first century – and the Pastor’s pious hypocrisy and gasps of abhorrence when faced with any acts of immorality raised more than a few sniggers. His faith that the new orphanage needs no building insurance because a ‘higher presence’ will intervene raises an ironic snigger too, as does his sanctimonious statement that we are not born to be happy but to do our duty – the duty that traps Mrs Alving with an unfaithful husband and emotional isolation. This is not helped by Franks McGuiness’s new version of Ibsen’s tragedy. His text occasionally lacks subtlety. He beacons the symbolism as though we were incapable of reading the intricacies of Ibsen’s original. Repetition of the word “ghosts”, for example, means he may as well have written the metaphor in large letters on the walls of designer Stephen Brimson Lewis’s set. Similarly Iain Glen’s direction, whilst tight, allows the performance to sometimes slide into melodrama. The final tableau is held painfully too long. Despite the flaws, this new staging, remains compelling. The pace of Glen’s direction had such control that one feels the interval was an unnessary interruption. Thanks to Lesley Sharp’s engrossing performance as the suffering Mrs Alving, Iain Glen’s confident Pastor Manders, and the ghost of Ibsen still present, this is a worthy production.